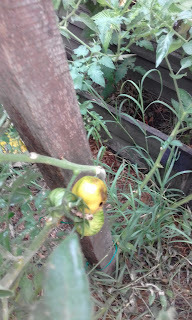 I've been waiting for the green zebra tomatoes for ages. They're the only ones I haven't picked. 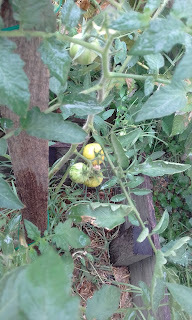 So I was excited to see a ripe one on the vine, ready for the picking. So I'm hoping to get at least one tomato off the bush to taste them before the caterpillars get to them all. So what are your natural caterpillar repellents?